You know that stinging feeling you get all over your hands when you cook nettle? Yeah – no more of that. This one here is ready to eat, no picking, no stinging, no cleaning, no soaking, just grab a spoon and you’re good to go. Nettle was one of those “yucky greens” that we were oh so skeptical about when we were kids, but somehow grew to love as we got older. 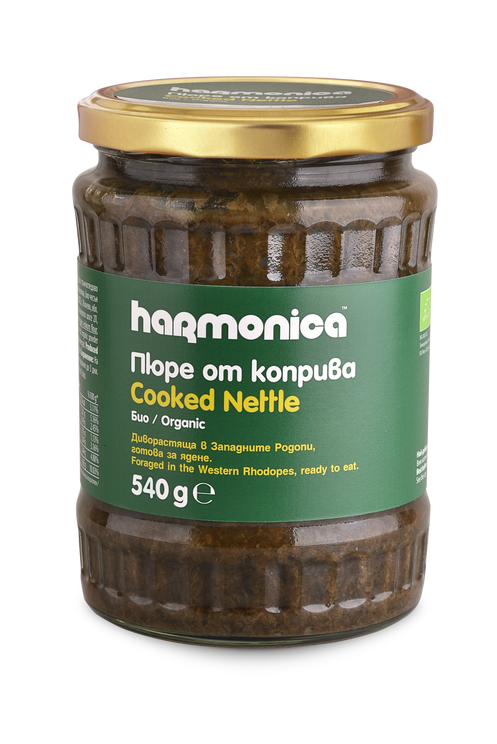 We love it more and more as we start to explore all the ways nettle is good for us, delicious to cook and generally wonderful in every way. This puree in a jar is made out of nettle that grows wildly all along the Western Rhodope slopes. It’s cooked with a pinch of spelt flour, sunflower oil, salt, garlic and sweet red pepper. Ingredients: organic wild nettle (70%), water, organic einkorn flour, organic sunflower oil, a pinch of Himalayan salt, garlic, sweet red pepper, and lemon acid as acidity regulator. Once it’s cleaned, the nettle is boiled in water. Then the spices are added together with the spelt flour and once ready, it’s poured in a jar, closed tightly and ready to eat whenever you feel like adding a touch of spring to your menu. Warm soulfull soup with cheese, porrage with butter and crumbled Sirene or just as a side dish. Local organic vegetable! Ready for direct consumption!